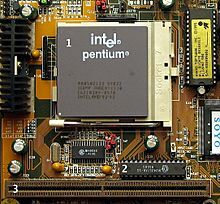 A central processing unit (CPU) is an important part of almost every computer. The CPU sends signals to control the other parts of the computer, almost like how a brain controls a body. The CPU is an electronic machine that works on a list of things to do, called instructions. It reads the list of instructions and does (executes) each one in order. A list of instructions that a CPU can run is a computer program. The speed that a CPU works at is measured in hertz (Hz). Modern processors often run so fast that gigahertz (GHz) is used instead. One gigahertz is one billion cycles per second. Most CPUs used in desktop (home) computers are made by either Intel or Advanced Micro Devices (usually shortened to AMD). Some other companies that make CPUs are ARM, IBM, and Sun Microsystems. Their CPUs are usually used for more specialized things, like in mobile phones, cars, game consoles, or in the military. In the 20th century engineers invented many different computer architectures. Nowadays most desktop computers use either 32-bit CPUs or 64-bit CPUs. The instructions in a 32-bit CPU are good at handling data that is 32 bits in size (most instructions "think" in 32 bits in a 32-bit CPU). Likewise, a 64-bit CPU is good at handling data that is 64 bits in size (and often good at handling 32-bit data too). The size of data that a CPU handles best is often called the word size of the CPU. Many old CPUs from the 70s, 80s and early 90s (and some modern small CPUs) have an 8-bit or 16-bit word size. When CPUs were invented in the middle 20th century they had many different word sizes. Some had different word sizes for instructions and data. The less popular word sizes later stopped being used. 1823 Baron Jöns Jacob Berzelius discovers silicon (Si), which today is the basic component of electronics. Add one number to another. Test to see if one number is bigger than another. Jump to another place in the instruction list. To run these steps, the CPU could have a separate module (separate electronics inside the CPU) that runs each step. The output from one module (for example, the bits of the instruction) would be the input to the next module (for example, the instruction decoder). A set of modules connected like this is called a pipeline. Pipelines can be found in many other places in electronics too, not just in CPUs. Often it is possible to run some steps from different instructions at the same time, which makes the CPU faster. For example, we can read an instruction from memory at the same time that we decode another instruction, since those steps use different modules. This can be thought of as having many instructions "inside the pipeline" at once. In the best case, all of the modules are working on different instructions at once, but this is not always possible. Some newer processors have multiple cores. This means that they have many processors built on to the same chip so that they can run many instructions at once. While the individual cores might be slower than a single core processor, all the cores can work together to go faster. This means that the GHz might be lower, however the overall speed of the processor will be higher. One road having one lane, which takes up 50 cars in 10 minutes. Another road with two lanes will take 100 cars in the same 10 minutes, and if one of the lanes has a problem, cars can go to the other lane. In today's modern computers, some processors may have up to twenty-two cores and are available to all consumers, like the Intel Xeon E5-2699 v4. Central processing unit Facts for Kids. Kiddle Encyclopedia.